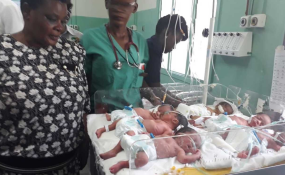 Kakamega Health CEC Rachael Okumu admires five children born at the County Referral Hospital. "I want to assure you that the babies are stable and we have to give them time to respond to the care," Dr Aruasa said. "We are now giving the babies all the specialised care they need. We are supporting their breathing through a ventilator; we are also expanding their lungs to ensure they breath properly," Dr Ngetich said. They condemned the practice of eliminating twins, terming it barbaric. Elders in Kochwa village, Kakamega County, told off a group of men who claimed the mother should kill three of the newborns as they were a "misfortune".